Jenna has always loved her friend Layna (and "baby" Taryn...sorry T.J. I think you'll always be "baby" to Jenna). Layna is 8 months older than Jenna but they have been around each other since birth. Ann was in need of a place for the girls last Friday so they came here for the whole day and it was a blast. We went to play group at Roosevelt elementary in the morning and the girls had a ball with the "frog" theme. We went home with all things frog! 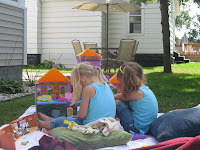 After lunch we played outside since it was so nice. 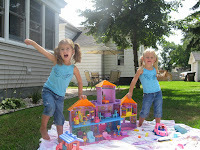 Here are the girls showing off their Dora castle. Yes, they are dressed alike! I had gone to Jeff and Ann's at 7:15 that morning and just took Jenna's clothes along. When Layna saw she had her butterfly tank top she wanted her on too.....they were so cute. Taryn decided that no nap was needed for the day, she wanted to play. Jenna was a big girl and helped get Taryn's shoes on and we made the walk to Captain Sundae for some ice cream, yum! By the time I brought them home there were 3 VERY sleepy yet hyper girls in the car. Thanks Ann for letting me take them, it was such a awesome and fun day!! !